The fun started on Feb 1, 2014 with welcome remarks and conversation aboard the Ms. Westerndam, Holland America Line. The cruise left out of Fort Lauderdale, FL. Being excited and overwhelmed at the same time, my wife and got to the port early to ensure we had enough time to get our luggage checked in and on the ship. The check-in line was a similar experience to boarding a plane. You have your security check and carry-on luggage inspected. Once past the security point, we were greeted by an Olivia Travel staff member who knew right away we were “First Timers.” She was “bright eyed and bushy tailed” and gave us the best and biggest smile. “You get a Olivia bracelet and you get a bracelet” the Olivia staff greeter said as she placed a bright pink bracelet on my wife and I. She informed us that it was a visual aid for others to help us around during our cruise. We finally made it to the counter and had our photos taken and information verified. You need a credit card for a hold and use on your room key. (SIDE NOTE: Your room key is used as a credit card, be sure to not use a debit.) We were now all checked in and it was off to the ship. When we “checked aboard” there were women everywhere! It was like we stepped into a Lesbian Vortex! They were smiling, we were smiling and everyone seemed to be instantly changed. We went to the elevator and met another couple that were from our same city and chatted for a bit. Once we got to our room, we check it out and the there was a knock on the door a few minutes later. It was our “Care Giver” Tobi. He informed us that he would be taking care of us for duration of the cruise. If we needed blankets, fresh fruit, information, what ever we needed he was there to make sure we had it for the entire cruise. He informed us of our “mail box” which had some mail in it. Each day, a daily itinerary of the day events would be provided as well as different pieces of lesbian information and magazines. There was also a list of the music, events, lounges and dining options on the ship. The list of all of the dining options included 5 different restaurants and an hour-by-hour outline of other events happening all though the day and night. 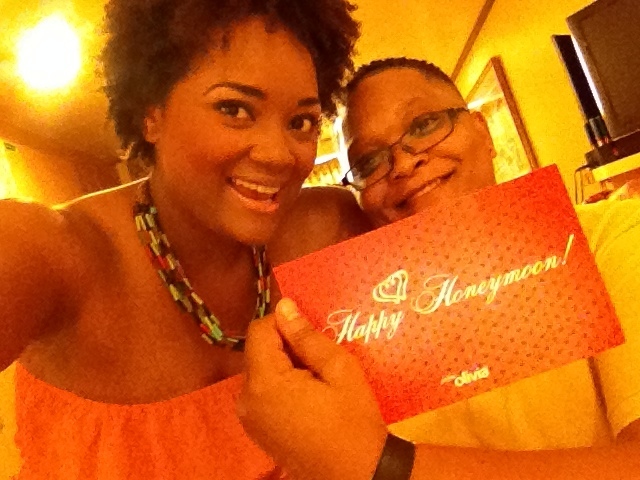 Once unpacked, there was another knock at the door and Tobi had a “Happy Honeymoon” cake surprise for us. You can have surprises pre-arranged to be delivered to your room. We changed into some more “vacationie” clothes and decided to explore the ship and lounges. We found a piano bar that was simply beautiful. There was a Baby Grand piano and as soon as we sat down we began to chat with other couples and people. After having a few glasses of wine, we decided to do some more exploring and found the shore excursion-booking desk. The staff was helpful and informative. Later on that night we joined the “Sail Away Party” with the beautiful DJ Rockaway and had a blast. The ship started to sail away and our vacation was finally underway. The first day was a great experience and a smooth transition into the start of our 8-day honeymoon vacation. Feedback: Olivia Travel has a functional process for new travelers and give many payment options for those that want to plan a Olivia trip. Make sure to ask the staff if there are any specials or discounts on staterooms. Olivia Travel is one of the most exquisite cruises you may ever go on, if you are an open and proud lesbian that is. For those of you that have never heard of Olivia Travel, this is where lesbians go to vacation for all exclusive reasons. Olivia is where lesbians can just be a lesbians with no strings attached (No punt intended). The Olivia Travel charters a ship or entire resort to cater to ALL lesbian women. When I realized this my head nearly popped right off of my shoulders! My wife and I recently got married and wanted to do something really special to celebrate our new life together. We had been putting off an Olivia Travel cruise for sometime, and wanted to make sure that we were able to enjoy ourselves entirely, financially speaking. When some of our lesbian friends heard we were going on an Olivia Travel cruise we got some “hairy eyeballs” and the “Look of disgust.” To be frank, Olivia Travel Cruises and Resorts are not cheap. In fact, they are double if not triple the cost of your average cruise. But, that is just the point. Olivia Travel is NOT your average cruise you would normally book. There is good reason for the extensive cost. With an Olivia Travel cruise or resort you are quite literally paying for exclusivity and the able to “Feel Free” as the Olivia Travel phrase states on all of their “first time” travelers pink bracelets. The entertainment is lesbian derived and all port calls are gay-friendly. No need to “fake the funk” with this crowd. Just to be clear, I do NOT work for Olivia Travel nor any affiliated companies. These are merely my opinions from my experiences of my Olivia Travel Cruise. That being said, I figured why not write a short blog about my experiences. Then I thought, one blog wouldn’t be enough. To really get the full effect of the experiences I would have to blog about each and everyday of the cruise. 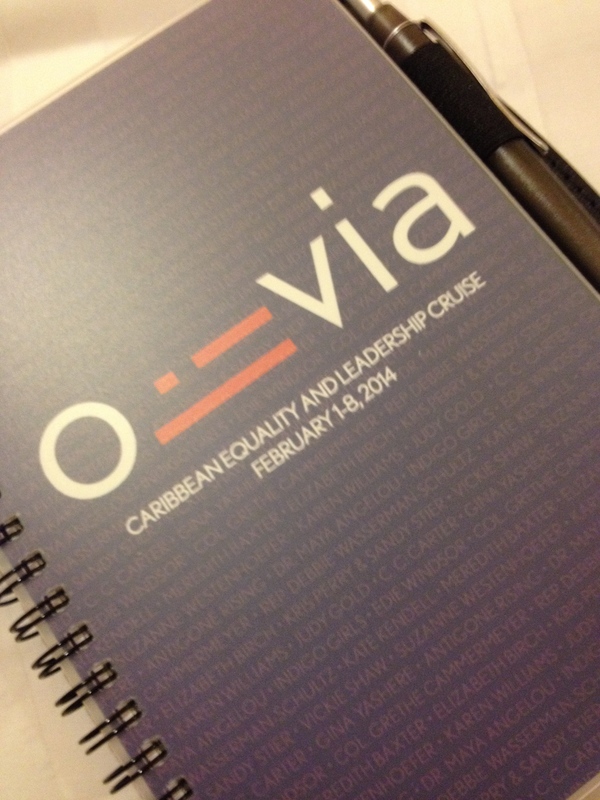 So, on behalf of all of the women that have never experienced an Olivia Travel trip, I will do a “Day by Day” feedback and review of my experiences on the last Olivia Travel cruise: Feb 1 – 8, Caribbean Equality and Leadership Cruise. I hope you enjoy my feedback and reviews. Stay tuned for Day 1: Feb 1 Feedback and Review.